On December 10, 2011 the ACS Student Council sponsored a Movie Day for all ACS students. 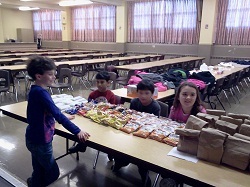 Council members had a wonderful time setting up the auditorium and preparing snacks for movie watchers to enjoy. Students had a choice of two different movies. The first showing was The Muppets Christmas Carol. There were about 25 students present for the morning session. The afternoon session was Polar Express, attended by around 30 students. Everyone was given a choice of a drink and snack at intermission. This was ACS Student Council’s first big project. They were excited to host this fun event. It was such a success that they are already planning their next Movie Day.